Welcome to the Speech Motor Action + Control Lab. We study speech production—the physical act of producing vocal speech. We take a broad approach in our research, focusing on the relationship between the abstract, cognitive-linguistic system, speech motor behavior, and brain function. 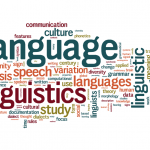 Speech production is perhaps the most complicated motor activity humans produce. There are around 100 muscles that we use to speak (muscles that move the lips, tongue, jaw, and other parts of the mouth as well as muscles that control our breath). We need to coordinate the activity of all of these muscles with incredible precision in both space and time. To take a simple example, to produce the “v” sound at the beginning of the word vet, we need to put the lips very close together, just a few millimeters apart. If we close them a little too much we will produce a “b” sound instead (bet) and if we open them a few millimeters too wide we will produce a “w” sound (wet). Unlike in other motor domains (like reaching or swinging a bat), these movements are not produced just to reach some target position in space at a particular time. Instead, the movements of speech must be controlled together to convey a linguistic, communicative message. Despite this complexity, healthy speakers are able to produce speech fluently and effortlessly. We study this process using behavioral testing in healthy speakers and speakers with neurological conditions as well as computational modeling. 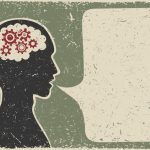 We form part of the larger Speech Motor Neuroscience Group at UW–Madison together with the Brain, Language, and Acoustic Behavior Lab (PI: Niziolek). 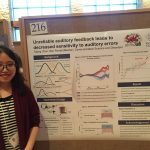 SMAC lab member, Taijing Chen, presents a poster on the topic of auditory feedback at UW-Madison’s Undergraduate Research Symposium. BLAB postdoc, Sarah Bakst, and SMAC P.I., Ben Parrell, speak about current research at the UCSF Symposium: Neural Bases of Speech Production. Ben Parrell gives the second Language Sciences colloquium talk of the semester.